Our brand new Special Breaks Brochure is now available to pick it up from one of our hotels or download. 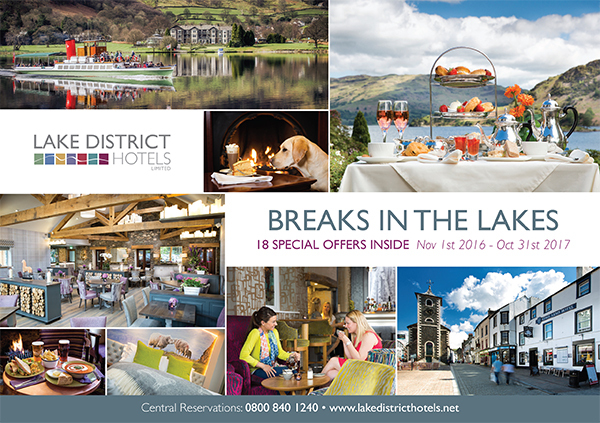 It’s filled with our best offers for you to enjoy in the Lakes from 1st November 2016 till 31st October 2017. From £97 per person* for a 2 night break this brochure will give you a wide choice of options. *Price based on a stay at the Kings Arms Hotel. Enjoy the most wonderful place on Earth… At Lake District Hotels we pride ourselves on trying to reflect the idyllic, beautiful scenery of our area and we’re passionate about making sure that our guests enjoy the very best that Cumbria has to offer. From central locations in quaint Lake District towns to breath-taking views over spectacular lakes, every one of our seven family-run hotels has its own distinctive charm, unforgettable atmosphere and unique team offering wonderful hospitality. We’ve been looking after guests for over 30 years, so we’ve crafted the very best romantic weekends, seasonal breaks and year-round offers to create your perfect Lake District holiday. Whether you’re packing walking boots for a winter ramble, dreaming of delicious Cumbrian menus or you simply want a few nights of luxury – you will find your ideal countryside getaway at one of our stunning hotels. So pack your bags and join us in the Lakes – we look forward to welcoming you!